Jayapura - The construction of Trans Papua's national road is temporarily stagnant, even the construction of 35 bridges on the Trans-Wamena-Mamugu Road Road is temporarily suspended. This is due to security disturbances from armed civilian groups in the region. Head of the Central Office for the Construction of Roads and Bridges of Region XVIII Ministry of Public Works and Public Housing (PUPR) Osman Haryanto Marbun explained before and after the local elections in Papua province that the security situation, especially in Nduga, Papua, was not conducive and triggered the cessation of work in the project Trans Papua. "We need security in the process of building roads and bridges in Papua, because before and after the elections, the situation is not conducive in some roads being built, especially in Nduga district causing the implementation of development work stalled," said Osman Marbun on the sidelines of member visits Commission V of DPR RI review Holtekamp Bridge Jayapura, Tuesday (31/7/2018). Osman said that due to the unfavorable situation, the construction of a bridge connecting Trans Papua Road is temporarily postponed. "Construction of 35 bridges, 14 bridges from Wamena-Mamugu-Kenyam and 21 bridges from Unuggu-Pahru are temporarily stopped until the situation is conducive," said Osman. He hopes that the implementation of road construction and TransJakarta bridge in the Wamena-Kenyam segment can be re-implemented in August. Osman said he was coordinating with the Cenderawasih Kodam to set up a security team, so the project runs again in August. 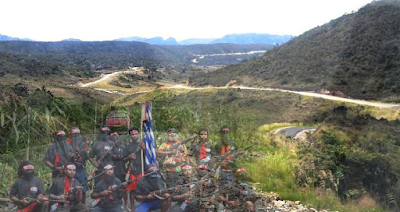 Potential security disturbances for the construction process of Trans-road and Trans-Papua bridge, continued Osman also on the road linking Wamena-Mulia-Sinak-Ilaga. "Not only on the Wamena-Kenyam road, but also on other sections there is potential for security disturbances that hamper the development process," Osman said. Nevertheless, Osman remains optimistic, the process of building Trans Jaya Road and Bridge will be completed in accordance with the 2019 target.